While doing my research about learner agency, I interviewed high school seniors about their learning experiences. Students’ common perception regarding learner agency was that they do not have enough choices to engage in their learning during their school days. This makes no sense! Students must learn how to make good choices during their K-12 experiences. That is a major part of human development. So why don’t we offer enough choices in classroom? I believe there are many answers to this question. The first that comes to mind is scary: we teach the way we were taught. There is a great chance for behaviorism being the predominant learning theory used in that classroom. Yet, it is generally accepted that intrinsic motivation is important for successful learning . Trying to build effective instruction is very hard, if we keep on ignoring what research shows about teaching and learning! Teachers who have experimented with letting students decide which tasks they would work on in the classroom report results of students finishing more tasks and being more engaged. Here is one such article. Furthermore, we have decades of educational research about benefits of learner-centered classroom practices being superior to operant conditioning and rote memorization. Students need autonomy to build critical and creative thinking skills that will enable them to practice perspective-taking as a part of their everyday learning experiences . Having choices allows students to perceive that they have control over their own learning – which makes the work they put in to feel a little less of a requirement and a little more personally rewarding. The other possibility for choices missing from the classroom is that providing choices can be intimidating for the teacher: it changes the power structure in classroom and shifts some of the responsibility from teacher to the students. Especially accountability-based educational models tend to vest the power to teachers instead of students, and keep on focusing on instructional effectiveness instead of individual learning process. Often the effectiveness is measured with standardized tests, which easily leads “teaching to the test”, and only measuring the end result of instruction. Yet, even in such educational environment it is possible to embed choices into classroom practices and support students’ interest in learning – which ultimately improves the test scores. This is not a quick fix. But changing the approach to embed individual choices for students is supported by contemporary research finding curiosity being associated with academic achievement . Third common reson for missing choices is the missing vertical alignment from one grade to the next one. Most often in this situation students have less autonomy than their developmental age and stage require. It is logical that kindergarteners need different rules nad less independence than 6 graders or high school students. In such case students’ developmental stage and classroom environment are incompatible. The theory of stage-environment fit  describes the conflict between increased need for learner autonomy (during adolescence) and a rigid learning environment. This can be avoided by helping teachers to collaborate and work together to build a continuum from one grade level to another. Supporting this vertical alignment is important both for the curriculum, so that teachers know what happens in other grade levels, but also for plannig the gradual release of student autonomy throughout school years. The fourth reason for missing choices stems from viewing students as a group instead of individuals. I understand, and know from my own experience, how hard it can be to make the learning experience personal for each individual student. But, when we apply the one-size-fits-all approach in instruction based on students’ chronological age, we are grossly ignoring their personal characteristics. Some students are more mature than others. Certainly there are milestones in development, some of those built into legislation, like getting your dricers license. What has always surprised me is the lack of autonomy in classroom for students who get to drive their own cars! I would rather see students learning to make good choices in the classroom than behind the wheel. Optimal level of structure and choices in classroom increases meaningful learning experiences and teacher-student interactions. Having choices is the prerequisite for ownership. Self-determination is part of being a human . We can see that in toddlers who suddenly disagree with everything. When my 4 kids were young and exhibited very stroing will, I tried to remind myself how great it is that they know what they want, because that is such an important step in development. 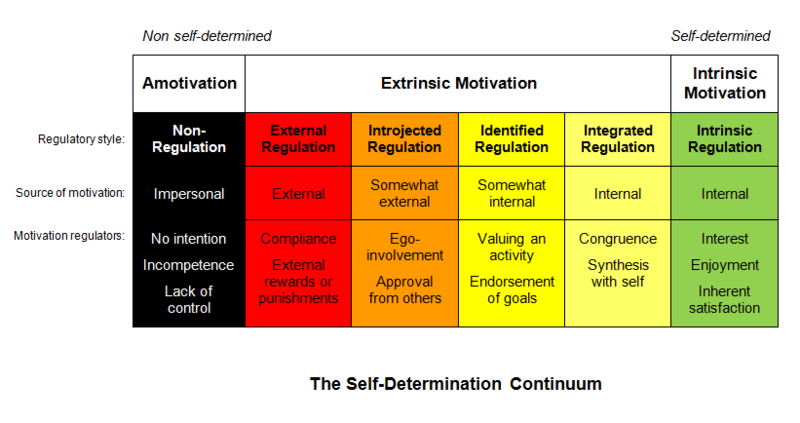 🙂 Self-determination relates directly to intrinsic motivation (here is an image of the continuum). Students tend to learn better when they are intrinsically interested in their studies, hence the need to provide autonomy and choices within the classroom structure. When students have choices they have lesser need to rebel against learning. And, quite frankly, students more often rebel against teaching than learning. During the K-12 students are still in the age where they are learning everything, all the time – and using what they learn to build their worldviews. School is –or shouldn’t be – an exception of this! Learning to make good choices is one of the very important parts of growing up. As teachers we cannot step back and think that our everyday interactions with students wouldn’t matter in the way they perceive their ability of making good choices. Like everything else in the maturation process, choosing is a skill that can and must be practiced and learned. But, we cannot punish students harshly for the mistakes they make during learning, because that will stop their interest of engaging in their own learning process. Therefore, it is important to use a non-punitive assessment system that supports learning and trying to learn. Encouraging and empowering students to learn more on their own can create trajectories where classroom learning is extended to students’ lives outside of the formal education. Being interested in one’s own learning is crucially important for deeper learning! Patall, E. A., Cooper, H., & Robinson, J. C. (2008). The effects of choice on intrinsic motivation and related outcomes: a meta-analysis of research findings. Psychological bulletin, 134(2), 270. Eccles, J. S., Midgley, C., Wigfield, A., Buchanan, C. M., Reuman, D., Flanagan, C., & Mac Iver, D. (1993). Development during adolescence: The impact of stage-environment fit on young adolescents’ experiences in schools and in families. American psychologist, 48(2), 90. and Bollmer, J., Cronin, R., Brauen, M., Howell, B., Fletcher, P., & Gonin, R. (2016). stage–environment fit theory. AZ of Transitions, 160. Deci, E. L., & Ryan, R. M. (2000). The” what” and” why” of goal pursuits: Human needs and the self-determination of behavior. Psychological inquiry, 11(4), 227-268. There are times when successful learning requires interactions between the student and the teacher/instructor. Often this is done in the form of feedback. As educators we should cherish these moments, because at best feedback is an opportunity to have an authentic dialogue with the student, which easily leads to a deeper learning experience. At the worst case scenario, receiving feedback makes the student think s/he was unfairly judged, which is an experience that may lead students to hate learning. Feedback for deeper learning is information about students’ learning process and meeting the goal. In all levels of education feedback is an essential element in guiding students’ knowledge construction. Transparent feedback and assessment practices increase the quality of cognitive learning and help students to have better understanding their own learning process. According to APA, effective feedback must be clear, explanatory, and timely (2015, p. 12). Engaging in dialogue with students about feedback is an important – but often forgotten – part of of teaching-learning interactions. This dialogue is the magic ingredient that supports deep learning in all levels of education, from preK to higher education and professional development. Feedback for deeper learning is not evaluation, assessment, labels, praise, or providing advice. Evaluation is a formal judgment about students’ work, often summative, and as such doesn’t function as feedback and supporting the learning process. Feedback is not assessment, either, because assessments focus on meeting competencies or goals/objectives, whereas feedback must focus on learning and guiding students to take action to meet the goals and build the competencies. Good and timely feedback enables students to “seek better strategies to complete the task” (Hattie & Timperley, 2007, p. 86). Grades, therefore, should never be considered to be feedback, because they are given after the learning is done, and there is nothing students can do to improve their learning. Feedback is not about labeling students’ work with attributes like “good job”, “nice work”, “sloppy”, or “needs more” – weather in person or as written on students’ product (typically in the margin of an essay?). To enhance learning, feedback must be provided during the learning process, instead of only measuring the end result, the product (task, paper, project, etc.). Whether the label is positive (praise) or negative is irrelevant, because labels in education may have a detrimental effect of students’ academic self-concept and their self-efficacy. This is exactly why it is essential to have a strong informal feedback system to support the meaningfulness of learning and teaching. Bandura and Locke emphasize the importance of self-reflection and agency as a theory that by “embodying feed-forward self-regulation differs from control theories rooted solely in a negative feedback control system aimed at error correction” (2003, p. 87). Feedback is an essential part of the learning process. Constructing learning environments and feedback around the fact that your students can affect their own learning helps them to become better learners for the rest of their lives. I cannot emphasize this enough! Regardless of the level of education, preK-12, college, university, workplace, or anything else, supportive feedback changes the way students think about their own learning process. Zimmerman call this “calibration” while talking about self-regulated learning (2013. p. 145). Both agency and self-regulation grow stronger with timely feedback, because it helps students to adjust their expectations and modify the plan to learn. Giving effective feedback is not always easy. However, it is a skill that can (and should) be learned and taught. The basic principle in effective feedback is: Mistakes are a proof of trying. Acknowledging the positive in students’ attempts to learn gives the appropriate kind of feedback to keep students willing to try new things, and make new choices. Being afraid of making the wrong choice prevents students (or employees) from learning anything meaningful. Moving away from labeling students or their skills, and starting to point out the progress they show in their learning process is a great way to start changing the feedback practices and emphasize deeper learning. Non-punitive assessment system is a requirement for feedback to support deeper learning. The first step is to have a clear idea of the most important target for the feedback and an understanding of the desired outcome of the dialogue. Using open ended questions to get students’ input on how they see their own progress helps to figure out where and why they may struggle. Sometimes just inquiring about the next steps the student is planning to take and verbally situating those into the bigger picture of their learning experience or task completion is enough. When students are thinking about their own learning plan they are already engaging in deeper learning. Please remember: only those mistakes that are allowed to be corrected can help students to learn more! Bandura, A., & Locke, E. A. (2003). Negative self-efficacy and goal effects revisited. Journal of applied psychology, 88(1), 87. Are your students engaging in deep or shallow learning? I believe “learning loss” is a made up concept. Think about it: you still remember many things and concepts you learned as a kid, right? Only those things that had no significance for you have been forgotten. Yet, we still seem to think that what is taught is also learned. That could not possibly be true! Understanding subjectivity and learning ownership is very important for every educator. Deep Learning and Shallow Learning (which is also called Surface Learning) are fundamentally different. The difference between the two types of learning is huge, isn’t it? Each of us utilizes shallow learning sometimes. Usually with subjects or topics that carry little significance to us but that we still need to learn to some extent, or maybe with something that we don’t expect to need after a while. Shallow learning can be seen as a chosen learning strategy and is a well accepted choice in certain situations. What scares me is that some students use shallow learning as their only strategy to learn or to even approach subjects to be learned. This inevitably leads to underachievement, and of course also losing the memorized bits of information, which we then call “learning loss”. Yet, it is worth noticing that some strategic learners choose to use shallow learning as their main learning strategy, in order to pass their exams and get good grades, while not being interested in really learning the content. The educational reality revolves around the fact that what is taught is not necessarily learned. And if the assessment is taken immediately after instruction, the facts and concepts are mainly held in our short term memory. When transfer happens, and students are able to use and apply the learned concepts in other situations, it also means they have been deep learned. Getting there requires collaboration between students and teachers: meaningful instruction from teacher’s part, and buy-in from students’ part. “What’s in it for me?” is the question every learner asks (more or less knowingly) before engaging in any given task. The answer may be an external reward (grade, certificate, badge, sticker, etc) or intrinsic interest (curiosity, need to know more about the subject, general interest), and this is where intrinsic/extrinsic motivation comes into the equation of teaching and learning. It seems obvious that shallow learning relates to perceiving learning as a product. Supporting student’s individual learning processes also promotes deep learning! Marton, F. & Säljö, R. (1976a). On the qualitative difference in learning I-Outcome and Process. British Journal of Educational Psychology, 46, 4-11. Learner agency as a concept in 21st century education relates tightly into students’ perceptions of their own learning experiences. Agency is the capacity to act, to make decisions about one’s own life and learning. Deep learning requires ownership and individual engagement with the content. Here is a succinct definition for deep and surface level learning strategies: “the basic processing operations that describe how students react to and interact with the learning material and with people present in the learning environment in order to enhance domain-specific knowledge and skills” (Boekaerts, 2016, p. 81). This is why learner agency is so important. Students must develop their skills in independent judgment. In order to do that they need ample opportunities to practice choosing. Being or becoming responsible for one’s own actions is one of the possible byproducts of public education. Recent research recognizes the importance of learning experiences that emphasize autonomous and agentive participation, including the opportunity to have control over oneself and one’s learning environment. There are various ways to perceive agency in the classroom. It is different to learn something than to be taught something. Being taught doesn’t necessarily mean that learning happens. It only means that the student has been present when the teaching has happened. This is very detached view of learning, and hardly motivates students to try. Memorizing content until the next test is included in students’ perceptions of detached learning. Sometimes students feel they belong to the school community, which makes them more compliant in learning activities, and a little bit less eager to exercise their agency. In these cases students depend on their teachers and just go through the motions and learning activities, as they are expected to do. Open dialogue can help students choose to actively engage in their own education and to become more accountable for their own learning. Teachers should support growing agency in the classroom, because the ownership contributes to engaging in deep learning. Students who have strong ownership are interested in learning more. Deep learning experiences can lead students to become ubiquitous learners, who learn anytime, anywhere. This unbound learning extends beyond school walls and hours, but we as educators must learn to acknowledge and credit this very independent learning. Students’ perceptions of their agency can span over several categories. These descriptive categories cannot be used to label students. In formal education the tradition has been to perceive students as objects of the teaching-learning interaction, with the expectation for students to absorb the facts presented by teachers or faculty. This view of education doesn’t fit into contemporary learning theories that emphasize knowledge construction. Educational research shows how important factors students’ ownership and knowledge construction are for academic success, yet many educational practices still rely on teacher-centered instructional models. Why? This seems to support the perceptions of detachment. There are many ways to support agency in the classroom. Building a learner-centered environment where students can choose how they practice and learn is an easy way to support learner agency. Students must have choices while selecting their learning resources. Researchers say that agency is about understanding what choices and resources are available (Kumpulainen et al., 2011, p. 13). Becoming responsible for one’s own learning can and must be fostered in the classroom context. Supporting learner agency improves the quality of students’ engagement in their own learning process, and help students become ready for the requirements of living in 21st century. Examples of engagement quality are “going through the motions” vs. “I make my own motions” and “being a classroom sheep” vs. “trying to understand how to transfer learned”. 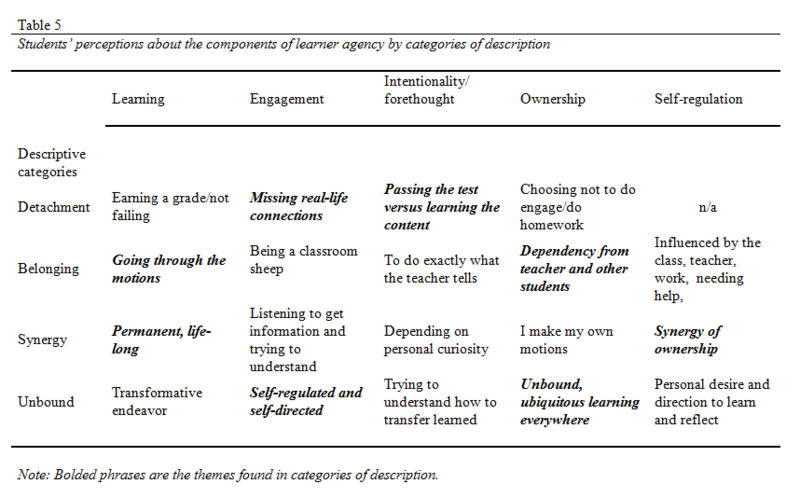 The table below displays components of learner agency and students’ perceptions of it, as see in my research. Sometimes agency may seem negative, for example when a student decides to leave homework undone, because they are okay with a grade that is less than perfect. Obviously, this is only a problem when learning is seen as a product, instead of (life-long) process. Understanding students’ perspectives and using practices that support learners’ agency helps teachers create better teaching-learning interactions. These learner-centered interactions will improve the quality of students’ learning experiences and also their academic achievement (e.g. Reyes et al. 2012). The importance of intentional engagement, subjectivity and shared classroom experiences cannot be overemphasized as means for deeper learning. Students must have an opportunity to exercise their agency. Boekaerts, M. (2016). Engagement as an inherent aspect of the learning process. Learning and Instruction, 43, 76-83. Kumpulainen, K., Krokfors, L., Lipponen, L., Tissari, V., Hilppö, J., & Rajala, A. (2011). Learning bridges – Toward participatory learning environments. Helsinki: CICERO Learning, University of Helsinki. Reyes, M. R., Brackett, M. A., Rivers, S. E., White, M., & Salovey, P. (2012). Classroom emotional climate, student engagement, and academic achievement. Journal of Educational Psychology, 104(3), 700 – 712. Smith, N.C. (2017). Students’ perceptions of learner agency: A phenomenographic inquiry into the lived learning experiences of high school students. (Doctoral Dissertation). Learning and studying dispositions are the filters we use when facing a learning situation. Sometimes these dispositions are helpful, other times they may hinder the learning process. The connection between learning and Real Life (RL) is important for all students, from kindergarten to higher education. Learning dispositions relate to the RL connection and thus regulate our interests, efforts and motivations to learn. Growth mindset is one part of the dispositions, as well as students’ self-efficacy beliefs and academic self-concept. Curiosity is yet another important concept for learning dispositions, because learning starts from wondering. For some students curiosity or persistence can be enough to make them ready, willing and able to learn. Other times students need additional tools, and providing opportunities for risk-taking, concentration or independence might be necessary. In this case it is crucial to have a non-punitive assessment method to support the positive outcomes of learning. Rubrics and feedback loops to be used before final evaluation are very necessary to emphasize the benefits of deep engagement, and fostering the development of future learning dispositions. Communication, collaboration and co-regulation are important learning activities for building positive learning dispositions, because sharing one’s own RL with others leads to deeper learning and understanding. I’m trying to figure out how to support students in creating a disposition that helps them to enjoy learning. The obvious reason for this is the fact that we engage much deeper in the activities we enjoy. And with deep engagement, we learn more. The information is not forgotten the next day or after the test, because it has some RL personal significance. Deep learning is seen to be more meaningful than reproductive learning (Lonka et al, 2004). One possible answer for supporting deep learning dispositions is to adopt a teaching disposition that emphasizes authenticity and empowers engagement (Kreber, 2007). Authentic teaching focuses on the RL connection, helping students to see the importance of learning in everyday life, so that they can engage in deep, personal learning. Authenticity and supporting helpful learning dispositions makes it easier for every student to be successful in their studies – and not only in reaching graduation, but also engaging in life-long learning and building their own knowledge. Authenticity seems to be one of the main threads in progressive education. I think it is important to remember that students are not learning for school, but for life. Their own personal RL, which is different from the one any of their friends and peers are living, is a major component of the learning disposition. That’s why discussing learning dispositions is so important. 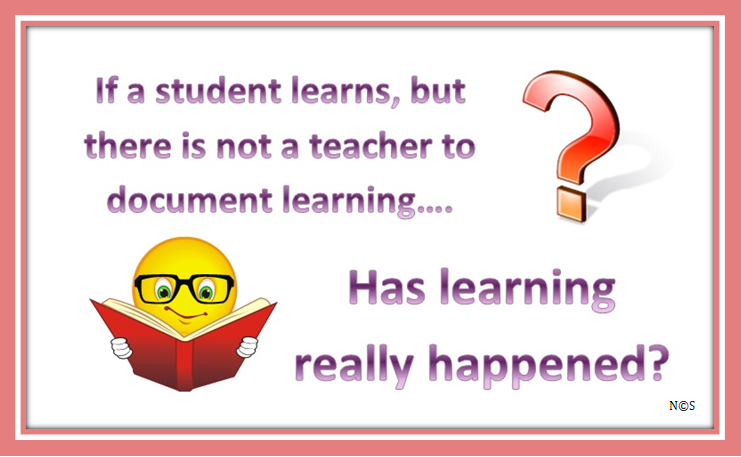 Students are making the value judgment of their learning anyway, so we as learning professionals should be helping them to find a helpful disposition. We are preparing students for the world that is a complex mixture of cultures and diverse beliefs. Knowledge is so much more than a fixed bunch of facts to be memorized. While memorizing disconnected pieces of information may be a nice trick in trivia game, students need to understand the contexts and connections of that information. Where did it come from, and is it trustworthy? And an especially important question is: how can we use this information? Misusing information is easy because it is shallow and has no situationality or contextuality – these are qualities of knowledge, where an individual has constructed an understanding of how given information fits into her/his worldview, beliefs and values. These are the same building blocks learning dispositions are made of. 21st century learning cannot be just memorizing factoids. Learning disposition can help students find RL connections and to engage in deep learning. But this needs to be communicated clearly to the students. It is insane to imagine that every student would be 100% interested in deep learning every detail of their every schoolday. In some cases it might not be the content to be learned that a student perceives being important, but perhaps learning more about oneself and how to support one’s own learning. In this case content learning happens as a byproduct. Emphasizing the change, resilience and meaning-making as important parts of learning process leads students towards a discovery of positive learning dispositions and deeper, meaningful learning experiences. Kreber, C. (2007). What‘s it really all about? The Scholarship of Teaching and Learning as an Authentic Practice. International Journal for the Scholarship of Teaching and Learning, 1(1), 3. Lonka, K., Olkinuora, E., & Mäkinen, J. (2004). Aspects and prospects of measuring studying and learning in higher education. Educational Psychology Review, 16(4), 301-323. Shum, S. B., & Crick, R. D. (2012,April). Learning dispositions and transferable competencies: pedagogy,modelling and learning analytics. In Proceedings of the 2nd International Conference on Learning Analytics and Knowledge (pp. 92-101). ACM. Volet, S., Vauras, M., & Salonen, P.(2009). Self-and social regulation in learning contexts: An integrative perspective. Educational psychologist, 44(4),215-226. Engaging in dialogue is essential for learning. Constructing knowledge cannot occur in a vacuum. Too often we think that any classroom discussion equals dialogue. It does not. Conversation and discussion are very broad concepts to describe educational dialogue. Debates are very specific interactions for presenting and supporting an argument, a genre of dialogue focusing on challenging assumptions and knowledge. Argumenting discussion can objectify a perspective and is thus important for reasoning and understanding (p. 108). Classroom dialogue exists to support understanding. It is not about winning an argument. Nor about an inquiry where students will end up in predetermined conclusion. The traditional classroom talk in the form of IRF (initiation-response-feedback/follow-up) or IRE (initiation-response-evaluation) is definitely not about engaging in dialogue, because the range of acceptable answers is very limited. These closed questions reflect behaviorist-objectivist ideology of education where the knowledge is transmitted to students, and their learning is tested with questions and tests. Well-crafted IRF can lead students “through a complex sequence of ideas” (p. 4), but does it really contribute to the productive interactions that help students to engage in deeper learning and craft individual understanding and transferable knowledge based on the information they received during the discussion? Dialogue is collaborative meaning-making by nature. It is about equal participants engaging in an attempt to understand the viewpoint of other(s) and defining the meaning in the social setting. Such dialogue is about creating new understanding together, and in that sense it denotes very constructive ideas of learning. Dialogue is very tightly tied to the classroom values and teaching/learning dispositions. In a safe learning environment, where students dare to ask questions and challenge their own beliefs, dialogue can be a very powerful tool for learning. The essential condition for dialogue to happen is equality. My truth cannot be better than your truth. Dialogue requires openness to rule over the dogma (p.172), in order to make exploration possible. Sometimes this is a very hard change to make in the classroom situation where the teacher is perceived to be the authority of knowledge. Communicating clearly to students about issues that don’t have one signle correct answer helps students to engage in dialogue with the teacher and each other. Wondering is often the first step in learning. Dialogue involves multiple dimensions of the classroom reality. Working with the tensions that occur in classroom setting is important to make dialogue possible. Having a non-punitive assessment system is important for fostering dialogue in the classroom. Risk-taking behaviors are not likely to happen in a learning environment where students get punished for submitting a “wrong answer”. Right and wrong, true and false, are dichotomies that belong to more objectivist pedagogy and official knowledge, and thus are destructive for collaborative meaning-making. Focusing on concepts instead of details is a viable way to start using the dialogue in the classroom. It is a good way to help students get engaged in their on learning process. Littleton, K., & Howe, C. (Eds.). (2010). Educational dialogues: Understanding and promoting productive interaction. Routledge. What is the central focus in your classroom or course? What is in the nexus of your instruction? Is it learning, performing, socializing, producing (or reproducing), obeying, memorizing, or something else? What is the most important thing for your students to remember from your class or course? It is surprising to realize how often our everyday teaching practices contradict our teaching philosophy! Thinking about the core purpose of education: helping students to learn. How easily it gets diverted from the original focus on learning, and becomes a rite of passage or about measuring academic performance! In everyday language we use such a huge a variety of definitions for “learning” – like answering correctly, passing, “learning a lesson”, memorizing, and so on – that it is easy to get confused and think that measured performance is equal to learning. I don’t think it is. Sometimes performance as learning means just cramming information into short term memory in order to pass an assessment or evaluation. Then that information can be forgotten, and it never becomes the much needed intellectual capital of knowledge. When we simply measure performance with assessments and evaluations, we only get to see the end result of students’ learning process. We don’t know how the skill or knowledge was acquired. We just know that this student passed an exam, or created an acceptable product. But the “learning” behind the score may not not what the educational systems wish it was: this kind of surface or strategic learning is usually not learning for life. It is memorizing for survival in testing-oriented educational context. To change the learning context we must focus much more on supporting students’ learning process, because acquiring transferable and life-long knowledge and skills is exactly what real learning is, or what it should be. When we are too busy cramming all the minor details of our beloved subject matter into the lesson or syllabus, we easily forget what learning really is about: for students to construct their own understanding of the subject. Not only reproduce something the textbook says, but to use critical thinking in order to fully understand the topic and how it relates to the world where student lives. Decontextualized learning is shallow or superficial by default. This is why I am very critical about prescriptive curricular and instructional design – students have different ways of thinking, different ways of learning, and different ways of knowing, and education has to accommodate those needs in order to be effective! The easiest ways that I know to engage in learning-centered education is to provide choices for students. Thinking about learning as acquisition and elaboration of information (Illeris, 2003), it is handy to let students choose how they obtain the information. Sometimes letting students have a choice of where they get the information is beneficial (yes, I think wikipedia is a good starting point, but obviously students will have to dig deeper than that, and provide appropriate references for their sources). Also providing choices for learning strategies supports both students’ self-regulation and their learning process. Does it really matter how your student learned the concept or topic, if they learned it well? In order to help students’ independent learning skills to grow even more, it is a great idea to provide choices for assignments and assessments, and use rubrics and formative feedback to guide students to the level of competence where they need to be. Naturally, each student will arrive to that point on their own, individual pace. I know that standardized tests don’t really fit into this picture, but their purpose is not to support students’ learning. Those tests exist to provide numerical data for stakeholders in the form of summative evaluations, not to promote learning-centered education. As teachers we may not have enough voice to change the current educational policies, but engaging in learning-centered education helps students to be ready for both the tests and life. How about making learning the central focus of your instructional practice?